I bet you've seen all three of these responses from certain readers, readers who struggle to comprehend what they've just read. Sometimes these students mislead you with their reading accuracy and fluency. But then you ask to tell you about what they've read. Enter: the coping strategies. Maybe they feign understanding, yammering on in circles, adding in a big word from the story here and there to distract you. Or maybe they throw out a vanilla response with that notorious questioning lilt in their voice, desperately hoping they've hit upon a crumb of truth. Or maybe they hope that if they sit still long enough, staring blankly at their book, the story will suddenly make sense. That, or you'll forget they are actually alive and you'll move on to something else. 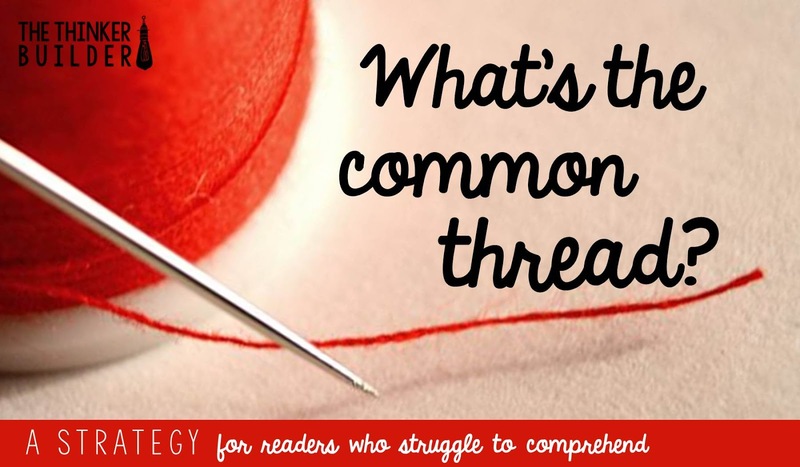 The struggle to maintain solid comprehension of what is read, as it is being read, is a difficult struggle to address, especially when the student has developed ways to mask it. There are lots of comprehension strategies and it feels like the student needs them all, and needs them right now. I am not here to say there is an easy solution or quick fix. But I want to share with you a simple strategy I've used to help these readers. I call it, The Common Thread, and it's a strategy to help readers who struggle to understand and remember the basic plot of a story. What I do is first ask myself, What is the common thread that runs throughout this entire text? Not a theme or underlying message. That's too abstract for this situation. What tangible part of the story is integral to the beginning, the middle, and the end? More often than not, my answer is: the main character. So then my goal becomes getting the reader to latch on to this one thread, and to follow it closely. I want to narrow the reader's focus to the main character, knowing that if the reader can follow the actions of the main character, his comprehension of the entire story will follow right along. Me: Okay, Sam, I have this new book for you to start today. I've read it before, so I know the main character is this kid named Jack. Do you see him here on the cover? Sam, you're just staring at the cover. I asked if you see Jack on the cover. Will you answer me? Me: Yes, you'll answer me? Or yes, you see Jack on the cover of the book? Sam: Yes to everything. Thinking: Are you crazy? Me: Good. Now close your eyes. Can you still see Jack? If not, look at Jack again until you can close your eyes and still see him. When you start reading the story today, you're going to follow Jack. Like, literally follow him. You're going to picture yourself right next to Jack, wherever he is. You're going to go with Jack wherever he goes. Sam: (Awkward chuckle) Um, that's creepy. Me: Yes, if this were real life, it would be totally creepy. Jack would be so annoyed with you. Maybe even afraid. He'd probably get a restraining order. But you're going to do it for this story. You're going to follow Jack. What Sam doesn't realize is that what I'm wanting him to do is exactly what strong readers do when they read a story with a really strong character. 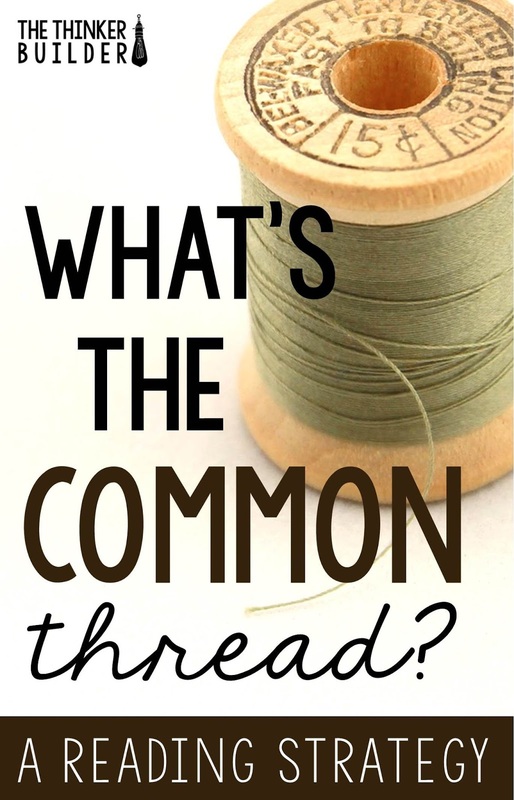 They follow that character around, visualizing his every move, connecting to his feelings, judging his choices... "following the thread" through the entire story. I get started reading aloud a portion of the story to Sam, modeling what I want him to focus on. I pause often, after every paragraph at least, and tell Sam what I'm thinking, asking him if he's thinking the same thing. Then I ask Sam to read aloud, and I listen. I stop Sam way more than he wants me to stop him. I ask him what he sees Jack doing. Literally everything we read I want to tie back to our thread, Jack: What did Jack just do? What just happened to Jack? Where did Jack just go? Who's talking to Jack? And for any section of text that doesn't directly involve Jack, I might ask... If Jack were here, how would he feel about that? What would he do? Do you think he'll find out? 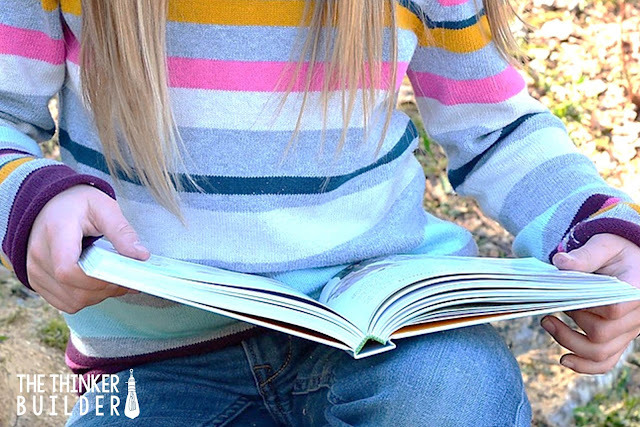 Eventually, I have Sam try reading a page or two on his own, and then we talk together about his reading, but instead of saying, "Tell me about what you read," or, "Tell me about the story," I say, "Tell me about what Jack did." 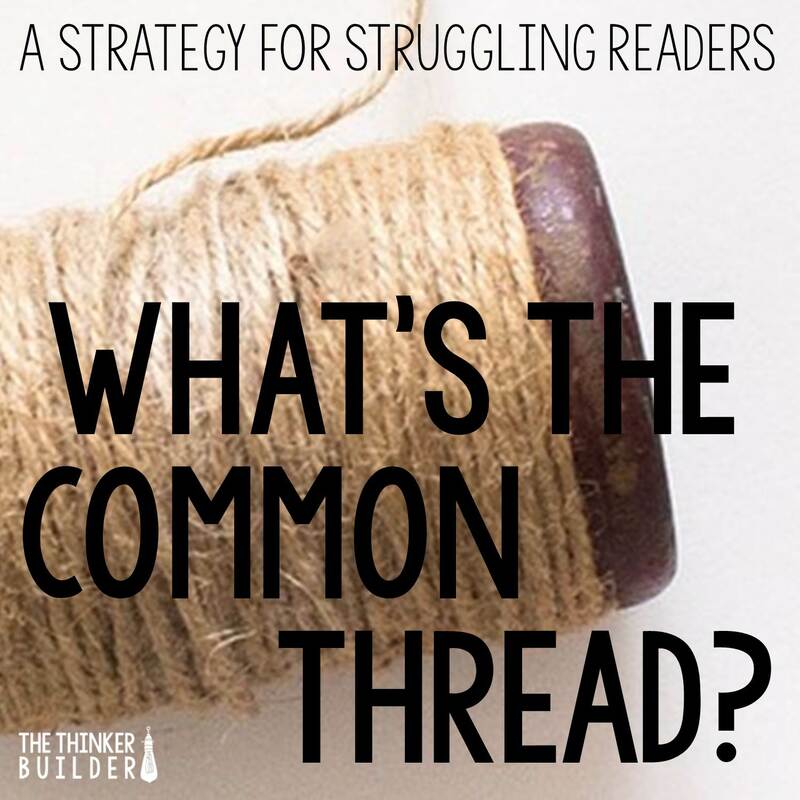 If the reader can latch on to the common thread, and follow it closely, a solid base of comprehension starts to form that can be added onto and strengthened with time and with additional strategies and practice. The common thread helps a struggling reader focus on less, yet at the same time focus on something really important that will lead them through the text.